Personalizing your android device to your very taste is one of the beauty of the platform.one of the ways of personalizing your device is by changing the default font to your choice. 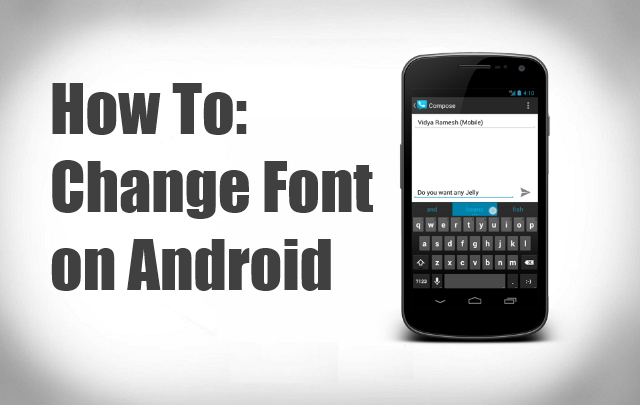 There are several methods of changing your system font on your android device. On Samsung devices you don’t need any third party application as the option is included in the display setting. But that’s a different case on other devices. Today I will be sharing with you guys two method of changing your system font. The first method is by using a file explorer (preferably root explorer) and also by using a third party application called font installer. Though have never encountered any problem changing my font but its strongly advisable for you to create a nanadroid backup before proceeding as you may endup with a bootloop if you installed a corrupt font or you get the steps wrong. ==> A rooted android device. if your device is not rooted, check here. ==> A file manager that can grant you access to your root directory. (I will be using root explorer). ==> The True Type Font (TTTF) you want to use. You can download here or here. You can as well copy from your pc. ==> Download and copy the font you want to use to your sdcard. ==> navigate to root directory. (Or you click on option and select home). ==> Now go to system/fonts. ==> Click on “mount r/w” at the right top of root explorer and copy the font you want to use to the fonts folder. ==> Long press on Droidsans.tff and choose rename. ==> Exit root explorer and reboot your device. This method is quite easier than the first and it is also less risky. The font installer application also generates a lot of fonts online, which you can even preview before downloading. You can also select an already saved font from you sdcard. Font installer can be downloaded alone and it also comes with rom tool box. So if you have rom toolbox installed on your pc, then you don’t have to download font installer. ==> A rooted android device. root your device here. ==> Download and install font installer. ==> launch the application. Or if you are using rom toolbox just swipe to the left till you get to interface and select font installer. ==> If you are connected to the internet a list of fonts will load up. ==> To preview any font just swipe to the right, click on the drop down arrow and s elect any font you want to preview. ==> To choose from your sdcard, swipe to the left just navigate to the folder where the font is saved. ==> Just reboot your device and enjoy. N.B: its advisable to create a nandroid backup of you rom before changing the font. I won’t be held responsible for any damage done to your device probably caused by not following the steps properly.